The book combines practical real-world perspectives with the technical knowledge job seekers need in order to excel at every aspect of their searches. Drawing on the knowledge Durfee accumulated through his own experiences, searches, and big-brand corporate hiring responsibilities, The Job Search Navigator abandons the "clinical approach" of many other career-advice books. Instead, Durfee gives easy-to-follow strategies and, perhaps more importantly, recounts in illuminating detail the kinds of mistakes that led him to develop these strategies. Despite recent reports of soaring corporate profits and gross domestic product growth, the effects of the Great Recession are still very real to the nearly 20 million Americans who are either jobless or underemployed. 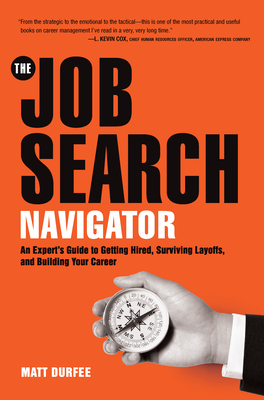 In these uncertain times, The Job Search Navigator is a reliable guide to every step of the 21st-century job hunt, whether readers are laid off, wanting to change careers after surviving cutbacks, or seeking a better full-time gig in a stagnant marketplace.